This blog follows on from the last, which covered Joseph Doughton’s time as a lecturer in “Hamilton’s Grand Moving Panorama of the War in Russia”. In August or September 1856, Doughton moved from Hamilton’s to another travelling show, “Wladislaw’s Mechanical Exhibition of the War in Crimea”. This was the company whose name on the title page of his 1856 memoir (the Narrative of Joseph Doughton, late of Her Majesty’s 13th Light Dragoons, one of the heroes wounded at Balaclava in the Gallant Cavalry Charge) has puzzled me for some time. 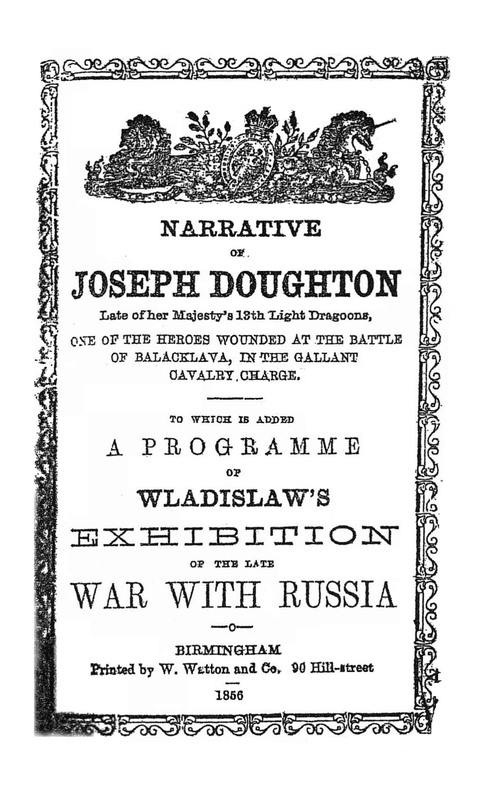 On the title page of his memoir, Narrative of Joseph Doughton, late of Her Majesty’s 13th Light Dragoons, one of the heroes wounded at Balaclava in the Gallant Cavalry Charge, published in Birmingham in 1856, is an intriguing advert for “Wladislaw’s Exhibition of the Late War with Russia”. What was Wladislaw’s Exhibition like? Did Doughton work for Wladislaw’s? If so, what exactly did he do? Until recently I didn’t have much of a clue. My first attempts to come up with anything didn’t amount to much, and I abandoned the search. Then, in April 2015, we were contacted from New Zealand by Rowan Gibbs. While researching the Hamilton family he had come across a number of references to Joseph Doughton’s frequent appearances as a lecturer not with Wladislaw’s but with a similar-sounding show – “Hamilton’s Grand Moving Panorama of the War with Russia”. Curiouser and curiouser. Doughton made appearances on stage with “Hamilton’s Grand Moving Panorama of the War with Russia” (also advertised as “Hamilton’s Grand Moving Panorama of the Seat of War”), giving a commentary on Russian trophies that were on display. 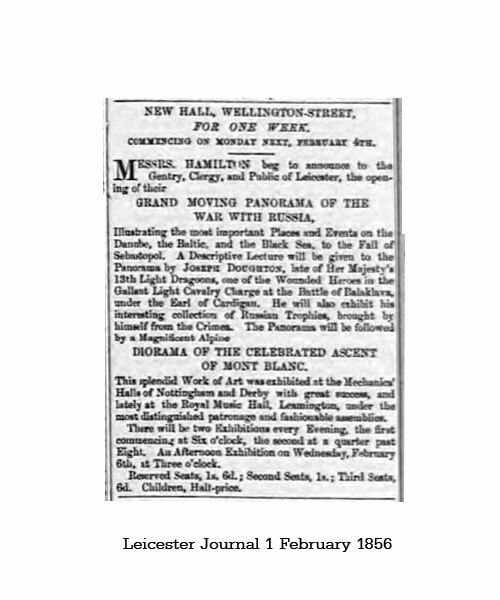 He was in Birmingham with the panorama in September 1855 (Aris’s Birmingham Gazette, 3 September 1855, p.3), “one of the wounded heroes of the gallant Cavalry Charge at Balaklava”. The panorama toured for several years and he may have toured with them, which would account for his moving around a lot. He still seems to be with them in Northampton in March 1856 (Northampton Mercury, 22 March 1856 p.3; not named). (Blackburn Standard, 20 May 1857, p.2; Burnley Advertiser, 4 July 1857, p.2). Over the last month a fairly intensive study of periodical press of the period has proved rather rewarding. Initially it seemed that Doughton was only linked with “Hamilton’s Grand Moving Panorama of the War with Russia”, but it then transpired that he had worked for Wladislaw’s as well, and indeed briefly for a third, “Lancaster’s Magnificent Panorama of the Late War”. His moves between rival shows is of some interest, and illuminates a number of aspects of nomadic popular entertainments immediately after the Crimean War. I’ll focus this blog on Hamilton’s Grand Moving Panorama, and leave Joseph Doughton’s even more dramatic experiences with Wladislaw’s to next time. Messrs HAMILTON beg to announce to the Gentry, Clergy, and Public of Leicester, the opening of their GRAND MOVING PANORAMA OF THE WAR WITH RUSSIA Illustrating the most important Places and Events on the Danube, the Baltic, and the Black Sea, to the Fall of Sebastopol. A Descriptive Lecture will be given to the Panorama by JOSEPH DOUGHTON, late of Her Majesty’s 13th Light Dragoons, one of the Wounded Heroes in the Gallant Light Cavalry Charge at the Battle of Balaklava, under the Earl of Cardigan. He will also exhibit his interesting collection of Russian Trophies, brought by himself from the Crimea. There will be two Exhibitions every Evening, the first commencing at Six o’clock, the second at a quarter past Eight. An Afternoon Exhibition on Wednesday, February 6th, at Three o’clock. Reserved Seats, 1s 6d; Second Seats, 1s; Third Seats, 6d. Children, Half-price. We dislike the use of superlatives [! ], but truth and common honesty compel to use them commenting upon the merits of this exhibition. Considered simply as a panorama, it far superior the style of painting and mechanical effects to anything have ever seen out of London. Many of the views were painted by Joseph Doughton, late of the 13th Light Dragoons, who formed one of the gallant 600 led by the Earl of Cardigan at the fatal charge Balaklava, where he was wounded. Mr Doughton, who we may remark, is highly intelligent and soldier-like young man, was an artist by profession before entering the army, and was thus every way qualified to sketch the stirring scenes in which he bore a part. All the views were painted, he informs us, under his superintendence, and it impossible not to be struck by their life-like and spirited execution. As the varied phases of the struggle are presented before the eye, from the disembarkation of our troops Varna, to the fearful conflagration which rendered the Allies masters of Sebastopol, emotions of no common order are excited in the spectators. At one period, the light and joyous step of the soldier from the transport deck on to the soil of the enemy, to the inspiriting sounds of “The Red, White, and Blue” fills the house with thunders of applause; anon, a solemn and subdued silence prevails, as the dead and wounded are borne from the battle-field to the plaintive notes of the Dead March. “The morning after the battle ” is, indeed, one of the most powerful of the tableaux presented, and, to our thinking, vividly realizes the account given by Mr Russell, of the Times, the pictorial ability of whose pen this exhibition has led us more than ever to admire. Among others of the more striking views we may mention the great storm of 1854 in the Black Sea, the city of St. Petersburgh by moonlight, and Miss Nightingale in the hospital of Scutari, the last painted by Mr Doughton, who was himself an inmate of the hospital many weeks, and who speaks in the most glowing terms of the unceasing kindness he received from that excellent lady. In common with numerous other shows, Hamilton’s was itinerant, but appears sometimes to have stayed several weeks in a venue (often, it seems “Mechanics Institutes” or “Temperance Halls” rather than theatres). I have not attempted an exhaustive listing of appearances when Doughton is likely to have been present, but I quite quickly found references in local press to performances in Salisbury [or Winchester?] December 1854), Gloucester (March 1855), Cheltenham (April-May 1855). It is likely that Doughton left in August or September 1885 (as we shall see), but the show moved on to Leicester and then Nottingham (November 1856), Grantham (January 1857), and Sheffield (January 1857). It’s not easy to know what the performances were like. They were certainly not the 360-degree static shows in permanent settings which we probably think of as “panoramas” or “dioramas”, some of which still exist today. The spectators were seated, the artwork unfolding (or rather unravelling from great rolls) in front of them. Music and and sound effects (including explosions) were vital to the experience, as was illumination. I have yet to find any images of a travelling Panorama (though surely some must exist), and there seem to be few secondary sources or scholarly studies. The best analysis I know of is Erkki Huhtamo’s study , “Global Glimpses of Local Realities: The Moving Panorama, a Forgotten Mass Medium of the 19th Century” (2002), which is mainly about the US but mentions the UK-based Poole’s and Hamilton’s Panoramas in passing. In my next posting I’ll write a little more about the nature of the spectacle (including the destruction sometimes wrought by the explosions), and Joseph Doughton’s troublesome move to “Wladislaw’s Exhibition of the Late War with Russia”.